Notes: Titles on the Line - College Hockey, Inc.
Conference championships, NCAA berths are at stake this weekend. 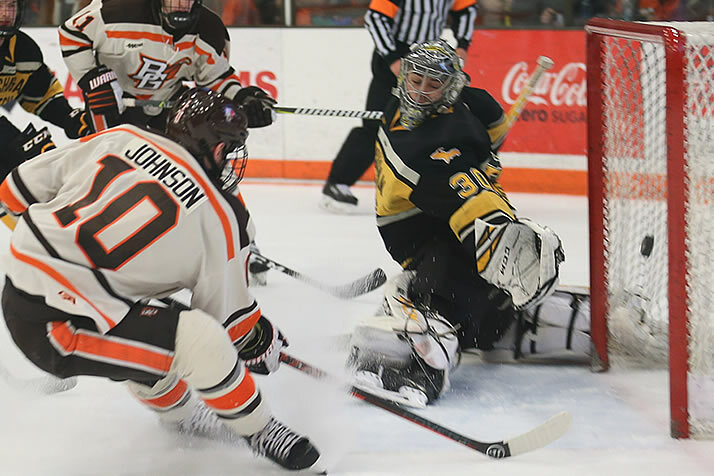 Max Johnson is the reigning WCHA Offensive Player of the Week (Photo: BGSU Marketing and Communications). Noteworthy in Mankato: Minnesota State last allowed two goals on Feb. 9 (eight games since); it last allowed three on Jan. 18 (15 games since) … Minnesota State has won six straight games; Bowling Green has won five straight. Noteworthy in South Bend: Penn State (2017) and Notre Dame ('18) are the last two Big Ten Tournament champions … Notre Dame (7.2 PIM/game) takes the fewest penalties in the nation; Penn State's power play (26.6%) ranks third … Cale Morris has two shutouts in the last three games. Noteworthy in Buffalo: This is the first Atlantic Hockey championship held at Buffalo's HarborCenter … HarborCenter is 23 miles from Niagara's Dwyer Arena … Robert Morris is in the Atlantic Hockey semifinals for the sixth straight season … Atlantic Hockey's top seed hasn't won the tournament since 2016. Noteworthy in Lake Placid: Three of the top four seeds advanced, with only top-seeded Quinnipiac missing … Harvard (2015 and '17) is the only school in the field to have won the tournament in the last eight years … The Crimson are in the ECAC semifinals for the fifth straight year. Noteworthy in St. Paul: The nation's No. 1 team (St. Cloud State) and the last two NCAA champions (Minnesota Duluth, Denver) are in St. Paul … Colorado College is making its first NCHC semifinal appearance … St. Cloud State (11-0-1) boasts the nation's longest active unbeaten streak … St. Cloud State swept the first-team All-NCHC forward positions. Noteworthy in Boston: Massachusetts makes its fourth Hockey East semifinal appearance and first since 2007 … Boston University, like last season, needs to win the championship to reach the NCAA Tournament … All three Beanpot Hockey East schools are in the field, including 2019 champion Northeastern. The top 10 candidates for the Hobey Baker Award were announced Wednesday and include a record-high six defensemen … Only one No. 1 seed won a conference tournament last season (Notre Dame) … The PairWise Rankings mimic the NCAA Tournament selection criteria.